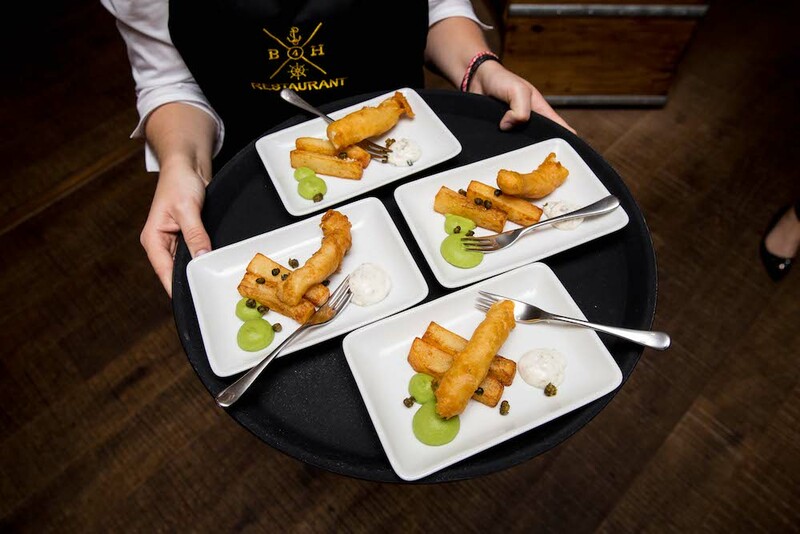 BaxterStorey — who provide bespoke hospitality services to unique venues around the UK — presented their latest culinary offering at Portsmouth Historic Dockyard last week, showcasing a fresh autumn/winter menu at Boathouse 4. Guests were treated to sample food from the new menu and were hosted by Michelin star chef John Campbell, who worked with the team to host the event. John is one of BaxterStorey’s chef mentors — supporting the training and development of chefs through the business’ Chef Academy and championing BaxterStorey’s philosophy of creating innovative food using fresh, seasonal and locally sourced produce. Whilst taking in the spectacular views across the dockyard and Portmsouth Harbour, guests dined on fresh salmon — smoked on-site at John’s restaurant The Woodspeen in Newbury. They also sampled dishes from the new menu including; smoked haddock soup with cave aged cheddar and toasted breadcrumbs, local beer battered cod with chunky tartare sauce and treacle sponge, and Navy rum roasted plums and Hampshire double cream. Sarah Miller, Regional Managing Director at BaxterStorey, said: “We are delighted the new menu received such a fantastic initial response and look forward to welcoming visitors, staff and the local Portsmouth community to enjoy our locally-inspired dishes. Boathouse 4 is open seven days a week for lunch and dinner. New for October, Boathouse 4 will also be offering afternoon tea and a Sunday lunch menu.